I ‘m sitting in a Starbucks right now writing this post and wondering how this has become my favorite place to blog. I must admit that I am not a fan of Starbucks but I do appreciate the fact that they have free wi-fi and I am out in the suburbs waiting for my son to finish basketball practice. There is something about working away from home that allows me to buckle down and accomplish what I need to. I am the world’s worst procrastinator. This 30 day challenge has been great for me since I can’t skip a post or put it off for another day. Distractions are not an option and that has really forced me to find dedicated time each day to work on my blog. 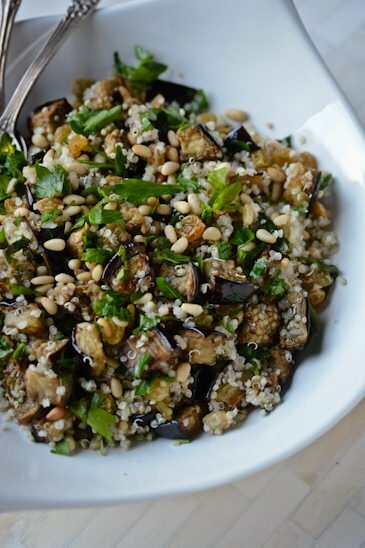 Eggplant seems to be one of those ingredients that people either love or hate. I am firmly in the love camp but sometimes it’s hard to prepare it without using a lot of oil to really get that silky lovely texture that I crave. 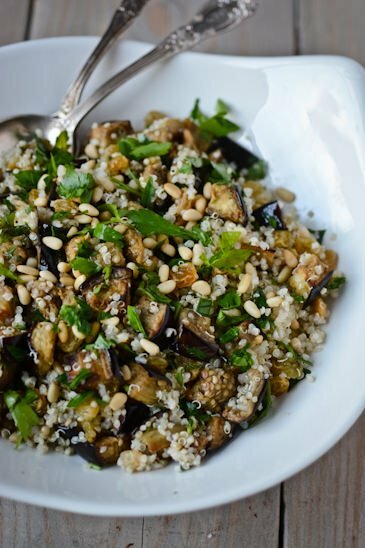 For this recipe I roasted it with a few tablespoons of olive oil and then tossed it with some vinegar soaked raisins, pine nuts, parsley and quinoa. It’s vegan as it is but it would be delicious with some added feta. Put the vinegar in a small bowl and add the raisins. Take the clove of garlic and smash it with the back of a knife and add it to the raisins. Let sit for 30 minutes while you prepare the rest of the ingredients. Cut the eggplant into 1-inch cubes. Line a baking sheet with parchment paper. Add the eggplant and the oil to the baking sheet, season with salt and pepper and toss well to coat. Cook for 25-35 minutes until the eggplant is soft takes on some color. Remove the garlic from the raisins and discard. Drain the raisins and reserve the vinegar. 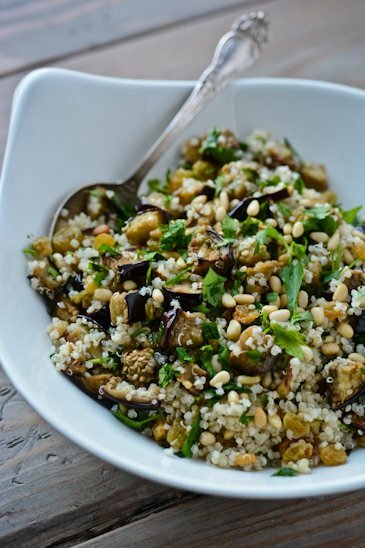 In a large bowl combine the quinoa, eggplant, raisins, and ¾ of the pine nuts and parsley. Taste and season with salt and pepper and add some of the reserved vinegar if desired. 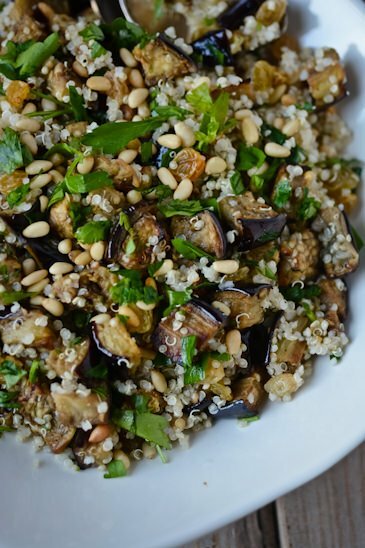 Divide the quinoa between four plates and top with the remaining pine nuts and parsley. I love roasted eggplant. This sounds like a great combination of flavors, especially with some feta added for a salty component. Yum! 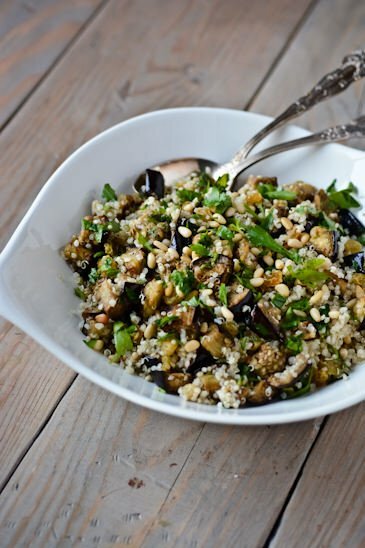 Just gorgeous, I’m a huge eggplant fan and just cannot comprehend disliking it! My partner loathes it (and zucchini and tomato …). At first this pained me. Then I realised that if THAT’S the only thing I’d change about him, well, then … I’ll take that. I want to thank you for your posts. I found you during an epic hangover. Tail between my legs, feeling low. Thinking I need to live a better life. Thank you. I’m glad you found the blog and are enjoying it. I have a confession to make, my husband won’t eat about 90% of the recipes that I post on my blog. He’s pretty set in his ways but my son has really expanded his palate and is much more open to eating new foods since I started the blog. 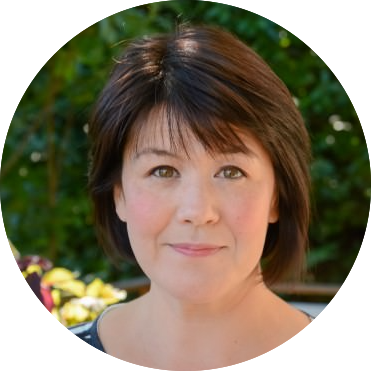 We all have those moments when we need to step back and ask if we are doing the best things for our bodies and our minds. I’ve found myself in the same situation as well, minus the alcohol. I just try to make small changes and don’t beat myself up when I have a lapse.